When was the last time you researched about your next new phone by going to your neighborhood shop? A long time in the 90’s probably, right! See that’s what E-commerce has done to your purchase habits. ‘E-tail’ is how you sell your product in the 21st century, irrespective of who it is! As far as convenience is concerned, you could be selling your shoe to your bro over the internet if you want. Truth is our domestic market is exploding with users of E-commerce. 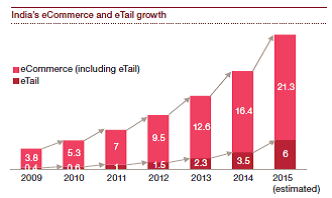 According to a research conducted by PWC analyst and industry experts, E-commerce has seen a growth of 34% from 2009 to 2014 and is expected to roll in about 22 billion USD in 2015 alone! And why wouldn’t that happen when the number of internets users have grown in an excess of 6 folds from 2007 and now the tally stands in upwards of 300 million users as of 2014. Now high with all this windfall growth and seduced further by innovation of mobile device, e-commerce had its love child M-commerce. Now M-commerce is truly the consummation of the marriage of ecommerce and technological innovation as it was the step-ahead version of E-commerce. Also, with the import of smart devices almost doubling to 80 million this year, Junior has been widely accepted by the masses. Despite its unanimous acceptance and user value extracted by the masses, many people still believe that M-commerce is an extension of E-commerce, and that businesses are just conducting their E-tailing on a mobile device. But functionally is it true? It is estimated that more than 50% of total online orders are placed from mobile devices and by the end of 2015, M-commerce transaction (mainly B2C) would surpass desktop-based E-commerce. 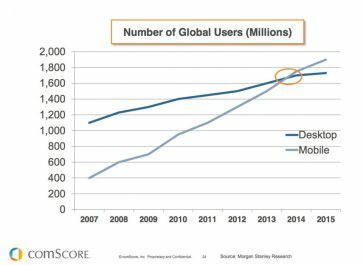 Snapdeal which is one of industry’s forerunners in E-retail has acknowledged this fact and revealed that 65% of their orders come from mobile devices and they are expecting that by end of the year it would be around 90%; Myntra has already announced that it is planning to be a mobile-only market place. These stats reflect this distinct shift of power and influence from E-commerce to M-commerce. A crucial aspect of it is because though E-commerce is flourishing in the urban realms, M-commerce is tying itself to the 2nd and 3rd tier cities. And companies like Myntra claim that almost 60% of their revenue is generated from this. To be honest, you connect more to you mobile devices than your computers. And to scrutinize our domestic market, there are more people who could afford a smart mobile device than a laptop or desktop especially in the 2nd and 3rd tier cities. So why would you give up exposure to more than half of a nation? And that too when approximately 65% of internet users are e-commerce customers? E-commerce tries to tend to you as personally as it can, but tied by wires it cannot follow you around and cater your every need. But that is not a concern for M-commerce; it will be your best friend that fits in your pocket. It can save your preferences, understand your opinion and bring relevance to your otherwise cluttered world. To E-commerce he says- Beat that!! So we see junior is fast taking over an empire his father E-commerce has created. Some analysts believe that this cannot sustain and Mobile commerce will always function as part of E-commerce, while others believe M-commerce is not an extension at all, rather it is an explosion! The data suggests Mobile commerce is in fact on the verge of surpassing E-commerce in retail, but it would not, in our opinion, supersede e-commerce entirely. It would still be interesting to speculate if junior does in fact launch a coup against his father.